Whispers in the Loggia: Sr Carol to White House: The "Accommodation" Is "Unacceptable"
Sr Carol to White House: The "Accommodation" Is "Unacceptable"
In a conspicuous turnabout, the trade-group representing the nation's Catholic hospitals has said it is "deeply concerned with the approach" taken by the Obama administration to its proposed contraceptive mandate, and called for the Department of Health and Human Services to "instead use an expanded definition to exempt from" the new policy "not only churches, but also Catholic hospitals, health care organizations and other ministries of the church." Coming in a five-page letter sent today by the Catholic Health Association to a top HHS administrator, the move (including draft proposals for an acceptable revision of the controversial Federal rule) follows months of public tension and quiet discussions between the US hierarchy and the association representing some 2,000 health-care facilities under the auspices of the Stateside church after the group's president, Daughter of Charity Sister Carol Keehan, voiced her approval of the White House's February "accommodation" on the plan, which the bishops deemed as being insufficient. Today's letter was signed by Keehan and CHA's immediate past and present board chairs. Previously, CHA supported the passage of the 2010 Patient Protection and Affordable Care Act over the bishops' objections to the law's treatment of funding coverage for abortions. In appreciation for the role the association's campaign played in the bill's enactment, President Obama famously gave Keehan one of the pens he used to sign the sweeping Federal health-care reform into law. On the initial announcement of the contraceptive policy in January, however, the CHA president backed the bishops, calling the White House proposal "a missed opportunity to be clear on appropriate conscience protection." In the wake of that statement, even the New York Times noted that the administration's subsequent undertaking to find an agreeable middle ground "was for" Keehan, who "had told the White House that" as originally proposed, "the new rule... went too far." "The more we learn," CHA said in today's letter, "the more it appears that the [mandate's] approaches for both insured and self-insured plans would be unduly cumbersome and would be unlikely to adequately meet the religious liberty concerns of all of our members and other church ministries." "The exemption in the final rule is narrower than any conscience clause ever enacted in federal law and reflects an unacceptable change in federal policy regarding religious beliefs." Notably, the CHA intervention stopped short of endorsing the extension of an exemption from the mandate to private business owners who object to it on conscience grounds -- the so-called "Taco Bell" clause -- which has become a particular cause celebre among the US church's conservative wing. The public comment period on the policy set to end next week, the association's letter comes on the eve of the Fortnight for Freedom called by the nation's bishops to protest the mandate's implications for religious liberty. It likewise arrives less than a month after 43 church entities -- led by the archdioceses of New York and Washington and the University of Notre Dame -- filed suit in a dozen Federal courts seeking an overturn of the HHS rule. CHA has long insisted on and worked for the right of everyone to affordable, accessible health care. We welcomed the enactment of the Patient Protection and Affordable Care Act (ACA), and support the ACA’s requirement that certain preventive services be available at no cost to the individual. We remain deeply concerned, however, with the approach the Administration has taken with respect to contraceptive services, especially abortifacient drugs and sterilization. The ANPRM [Advanced Notice of Proposed Rulemaking -- i.e. the contraceptive mandate] is the latest in a series of rulemaking actions by the Departments to implement the ACA requirement that group health plans and health insurance issuers provide coverage for a range of preventive care services without cost sharing by the covered beneficiary, including a subset of women’s preventive care services as set forth in guidelines by the Health Resources and Services Administration (HRSA). 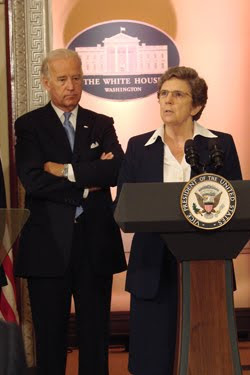 On August 1, 2011 HRSA issued its Guidelines on Women's Preventive Services: Required Health Plan Coverage (HRSA Guidelines) requiring coverage without cost sharing of all Food and Drug Administration approved contraceptive methods, sterilization procedures and patient education and counseling for women of reproductive age. At the same time, the Departments issued an Interim Final Regulation (76 Fed. Reg. 46621) proposing to create an exemption to the contraceptive coverage requirement for certain religious employers, defining the term “religious employer” so narrowly as to exclude Catholic hospitals and health care organizations as well as other religious institutional employers. CHA objected strenuously to the inappropriately narrow definition in its comment letter date September 22, 2011 and objected again when it was announced in January 2012 that the Administration would not make any changes to the definition. The final rule released on February 10, 2012 implemented the narrow religious exemption as proposed, but also indicated the Administration’s intent to propose additional rules to implement the contraceptive coverage requirement in a way that would accommodate the concerns of nonexempt religious employers with objections to providing, paying for or referring for contraceptive coverage. While this new development seemed at the time to be a good first step, our examination and study of the proposal as outlined then and in the ANPRM has not relieved our initial concerns. Accordingly, for the reasons set forth below, we continue to believe that it is imperative for the Administration to abandon the narrow definition of “religious employer” and instead use an expanded definition to exempt from the contraceptive mandate not only churches, but also Catholic hospitals, health care organizations and other ministries of the Church. If the government continues to pursue the policy that all employees should have access to contraceptive services, then it should find a way to provide and pay for these services directly without requiring any direct or indirect involvement of “religious employers,” as broadly defined. The Definition Of “Religious Employer” Must Be Broadened To Cover All Ministries Of The Church. --To protect such religious organizations from having to contract, arrange or pay for contraceptive coverage. The most effective way to achieve the Departments’ second stated goal would be to actually exempt objecting religious organizations from the mandate by expanding the definition of religious employer to include them. This approach would align the policy under the women’s preventive care regulation with existing federal law on conscience protection. The exemption in the final rule is narrower than any conscience clause ever enacted in federal law and reflects an unacceptable change in federal policy regarding religious beliefs. The ANPRM suggests that Code Section 414 could provide the basis for a definition of the organizations that would quality for the proposed accommodation. We reiterate our suggestion contained in our September 22nd letter that the concepts contained in Section 414(e) be used instead to develop a broader and more appropriate religious employer exemption to the contraceptive mandate. Under those principles, an organization would be covered by the exemption if it “shares common religious bonds and convictions with a church.” This definition would exempt from the contraceptive mandate Catholic hospitals and health care organizations as well as other ministries of the Church. Making this change could help address the serious constitutional questions created by the Departments’ current approach, in which the government essentially parses a bona fide religious organization into secular and religious components solely to impose burdens on the secular portion. To make this distinction is to create a false dichotomy between the Catholic Church and the ministries through which the Church lives out the teachings of Jesus Christ. Catholic health care providers are participants in the healing ministry of Jesus Christ. Our mission and our ethical standards in health care are rooted in and inseparable from the Catholic Church and it's teachings about the dignity of the human person and the sanctity of human life from conception to natural death. If The Government Insists That All Employees Have Access to Contraceptive Coverage Without Cost Sharing, Then It Should Provide And Pay for These Services Directly. As noted above, the Departments’ first goal as outlined in the ANPRM is to maintain the provision of contraceptive coverage without cost sharing to individuals who receive coverage through non-exempt, non-profit religious organizations with religious objections to contraceptive coverage in the simplest way possible. In the ANPRM, the Departments seek comments on (1) the approach of using the insurer to provide contraceptive coverage to beneficiaries of insured plans; and (2) several alternative approaches for implementing its intended accommodation for self-insured religious employers with objections to providing contraceptive coverage. In conclusion, for the reasons stated above and those included in our letter of September 22, 2011, we urge you at the very least to expand the definition of religious employer using the principles behind Section 414(e) of the Internal Revenue Code to make clear that religious employers, including Catholic hospitals and health care organizations, are exempt from the contraceptive mandate. SVILUPPO: Late Friday afternoon, CHA posted a (pdf) copy of the full letter on its website.